Let’s take a closer look at how degree days are used on NEWA. My last post explained what they are, how they are calculated, and why they are used. But where and in what ways can they be accessed? Every NEWA weather station has a unique ‘home page’ (Figure 1). This is an easy way to access degree day models during the growing season. When you follow a model link from the station page, results are automatically generated using data from that location. Figure 1. This is the station home page for ‘Ithaca Cornell Orchards’ in New York State. Degree-day models are also accessible from the navigation drop-down menus (Figure 2). This method requires user input to specify the station and location of interest. This gives you an opportunity to explore historical data, which is not an option when a model is accessed from a station home page as described above. Figure 2. NEWA degree day tools can be accessed from the navigation drop-down menus. Figure 3. The NEWA degree day calculator is a popular tool that provides customized calculations. 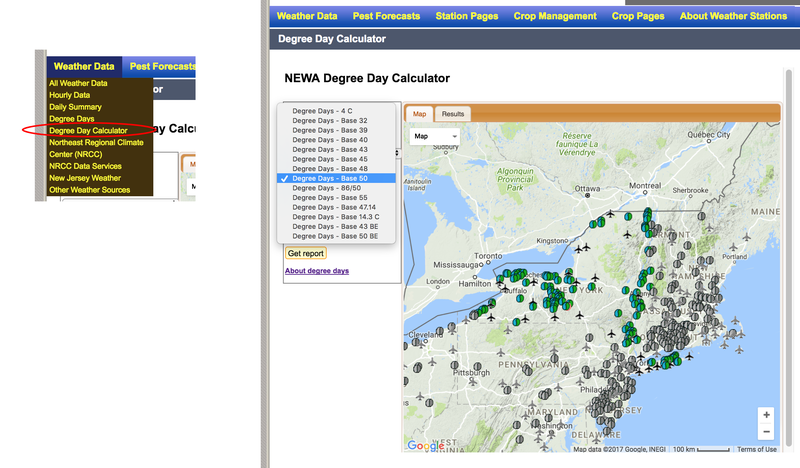 Here is a summary of current NEWA models and tools utilizing degree day calculations. For additional information about degree days on NEWA visit the URL link below. 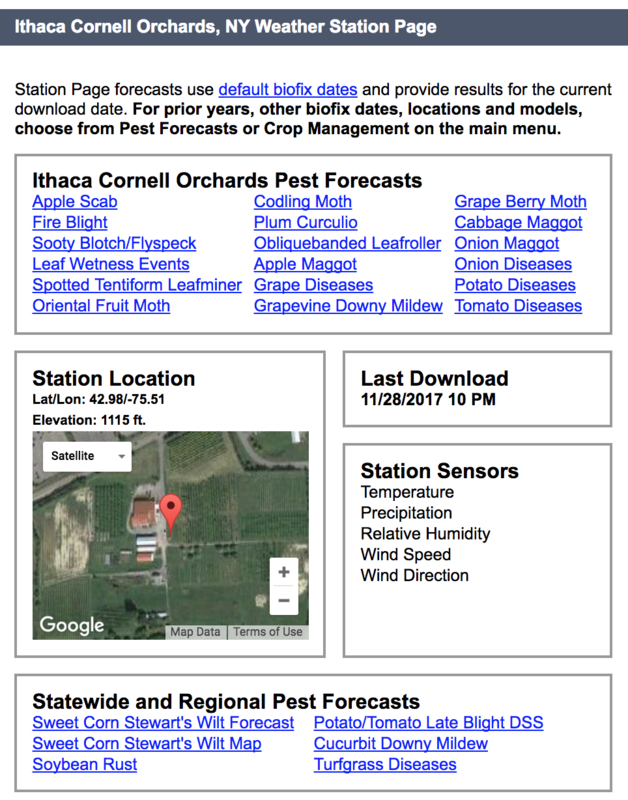 This entry was posted in about models, Degree days, grapes, insects, IPM, vegetables and tagged apple, Cornell Cooperative Extension, Degree days, grape, New York State IPM program, NEWA, production, vegetable on November 28, 2017 by Dan Olmstead. NEWA needs your help – take our online survey! The Network for Environment and Weather Applications (NEWA) is seeking new and experienced users to take an important online survey — it will only take 10 minutes of your time. Use your smart device, tablet or desktop computer! All responses are anonymous and confidential. They will not be shared with any outside group. Whether you’ve used NEWA’s online pest forecast models for years or have never used NEWA at all, we will benefit from your responses. Why? Because we are building a new website at newa.cornell.edu, one that’ll be as easy to use on your smart phone as on your desktop, and we want to build it the way you want it to be. NEWA is an online agricultural decision support system that uses real time weather data, streamed over the internet from 573 weather stations throughout the Northeast, Midwest and mid-Atlantic. 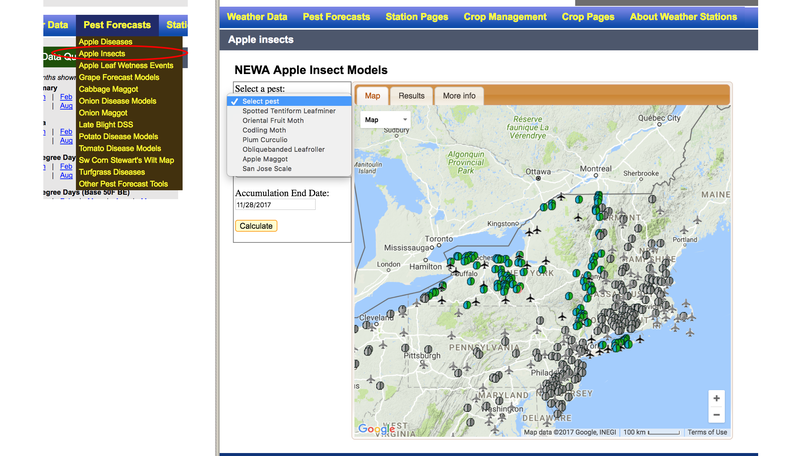 NEWA provides insect and plant disease pest management tools, degree days, and weather information for growers, consultants, Extension educators, faculty, and others. NEWA models and resources are available free of charge, and are used to make informed localized crop management decisions. The NEWA website will be upgraded soon and we want to know what users’, new and old, want and need out of the new website. This entry was posted in information, IPM, news and tagged Cornell Cooperative Extension, farming, New York State IPM program, NEWA, participate, survey on September 5, 2017 by Dan Olmstead.